Peyia, Paphos, Cyprus - This immaculately presented 3 bedroom detached villa is located in a quiet residential cul-de-sac in Lower Peyia within easy walking distance to local shops and amenities. The quality and finish of the villa is excellent and the property is beautifully maintained and cared for by the current owners. The ground floor features a spacious L-shaped living room with comfortable lounge, dining area and corner kitchen. The kitchen is nicely separated from the living area by a breakfast bar with top quality granite surface. Windows all around provide the living space with lots of light and there is easy access to the outside areas from both the lounge and kitchen. A hallway leads to a guest cloakroom, laundry room and double size bedroom with fitted wardrobes and shelving units. This room is currently used as a study, library and music room, but can easily be transformed back into a bedroom and the built-in bookcases replaced with en-suite facilities. As you walk up the marble staircase, again you get this lovely feeling of light and space. To the left is a large master bedroom with fully fitted modern en-suite bathroom and patio windows open on to a large covered private balcony with pleasant views of the surrounding area. Bedroom two is also a good size and has a modern en-suite shower room and a private balcony with nice views of the swimming pool and garden. The plot is impressively laid out with low maintenance landscaped gardens including a selection of colourful plants, shrubs and trees. The 10 x 5 swimming pool has roman steps and a handrail for easy access and there is plenty of surrounding terrace for relaxing in the sun. Directly off the kitchen is a patio which is very private and wonderful for outdoor dining and enjoying the relaxed ambiance of this lovely setting. 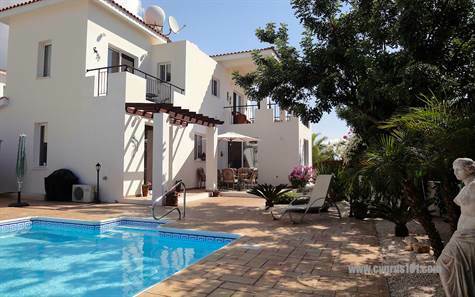 The property has full title deeds and is ideal as a permanent residence or holiday home. Please refer to MLS# 1323 when inquiring.